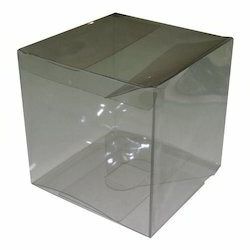 We offer a wide range of PET (Polyethylene Terephthalate) Transparent Boxes with the specification of the soft - crease. These boxes are available in varied shapes, sizes and designs. We can use these boxes for packaging cosmetics, stationary, electronics, craft and fragrant items in a delicacy and stylish way. We fully assure quality and durability of our PET Boxes which are reusable and will last long for years. We are offering Transparent Plastic Boxes to our client.